ROSEMONT, ILL, NOVEMBER 29, 2018 -- Raising the bar in lighting performance, operational efficiency and employee safety, Emerson today launched the Appleton™ Contender™ LED, an extra low-profile enclosed and gasketed LED luminaire that brings energy and maintenance savings of up to 65 percent to challenging low clearance areas, such as walkways, catwalks, stairwells and tunnels. 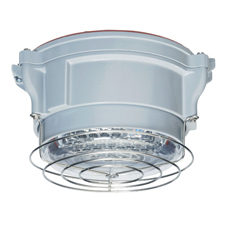 Designed specifically for retrofit applications, this cost-effective solution mounts directly to the hood of a competitor's High-Intensity Discharge (HID) hazardous location luminaire without an adapter, saving time and labor costs. "Until recently, HID has been the primary light source for hazardous locations. LED is now the go-to choice for retrofitting the installed base of tens of thousands of HID luminaries," said Michael McCormack, Director of Product Marketing, Emerson Automation Solutions. "To meet this growing market demand, the Appleton Contender LED was designed to directly retrofit to one of our competitor's most popular HID models. Additionally, it is certified with Appleton Mercmaster™ LED Low Profile globes and many of its accessories including the visor, angled reflector, globe guards and safety cable."